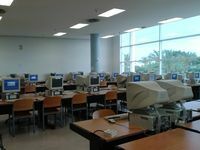 There are computers available for the University of Alicante users. They are located in the reading rooms of the different libraries. To use them, you have to identify yourself with the username and password of the UA e-mail/virtual campus. Users who are not members of the University community, they have to ask for a temporal identification at the information desks of the different libraries.